Because we are a nation that loves rooting for an underdog, one would assume that, as a nation, we would try to increase babies’ odds for success. It’s time for Congress to invest in the underdogs. America loves an underdog. Florida Gulf Coast reaching the Sweet 16 in the 2013 NCAA Tournament. Or legal clerk Erin Brockovich taking on utility companies on behalf of consumers. The spirit of determination and zeal typically personified by underdogs resonates with a country that prides itself on being the land of opportunity. Babies may not spring to mind as underdogs — although helpless and vulnerable at birth, they seem to represent limitless potential. Yet while all babies need nurturing and support to realize this potential, too many must also overcome huge obstacles as soon as they enter the world. For some, it may be a health or physical problem, and for too many others it may be the ominous weight of poverty that makes their success much more challenging. As champions for the underdog, one would assume that, as a nation, we would try to increase babies’ odds for success. Yet, the opposite is true. We have actually put a lid on opportunities that help young children thrive and learn starting at birth. 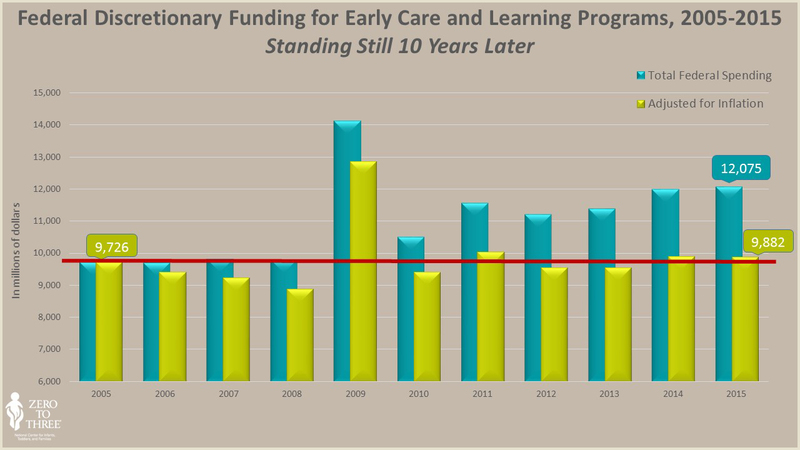 Year after year, Congress has chosen to keep aggregate discretionary funding for early care and learning programs relatively stagnant — so that in spite of increases in individual programs, in real dollars we are still where we were 10 years ago. A few years ago, Congress capped total spending so babies trying to beat the odds bump up against an artificial ceiling on access to support. It’s difficult to understand why. Of all the spending priorities Congress faces, investment in the future workforce — today’s babies — seems like the last place it makes sense to pinch pennies. It’s time for Congress to invest in the underdogs. Let’s take a look at the facts. The country’s rate of return on investments on quality early childhood development is 7-10% per year. When babies have the best foundation from which to start, their ability to learn, work and contribute to the economy increases exponentially. Those who receive good healthcare, are part of strong families, and benefit from positive early learning experiences, are less likely to end up dropping out of school, spend time in prison, or become eligible for unemployment and welfare benefits. No system is perfect, but one that is stingy toward those who need investment most is unwise and short sighted. Consider Ginger and John West from St. George, Utah. When their first daughter was born, Ginger — a full time mom — had a 10-year-old from another marriage at home. She was used to being a single parent, but sharing the duties and responsibilities with John was new for her. She was struggling with postpartum depression and her daughter, born with Down Syndrome, spent 18 days in the hospital before coming home. Ginger and John — a plumber — felt completely overwhelmed. Talk about an underdog. But had the Wests not been able to access Early Head Start, their life today — and their children’s lives — could be completely different — and not for the better. So as Congress returns in September and prepares to make critical appropriations decisions, it’s important to acknowledge that their choice to maintain funding caps on non-defense discretionary spending (NDD) is preventing thousands of young children from accessing these critical supports. When one of every two babies and toddlers in the United States lives in a family that is poor or near-poor, we’re talking about a large risk pool. Viewed in this light, these programs are not just nice-to-have: they are essential investments in the future growth and productivity of the nation. Only 5 out of 100 eligible babies and toddlers living in poverty are served by Early Head Start. Up to half of babies with disabilities or developmental delays do not have access to Part C early intervention services. We’re a country that believes in giving everyone a fair shot at opportunity. But the research is unmistakable: without early support for parents in fostering strong development and the chance to participate in high-quality early care and learning programs, gaps can appear early, often even before a child’s second birthday. That means that by the time some children reach preschool, they are already playing catch-up. Yet we know of children from disadvantaged families whose participation in high-quality early care and learning from birth greatly increased the odds that they graduated from college, earned more money, and became healthier adults. These are the true underdog stories. When families are given the tools to succeed, the country follows. And early learning opportunities, starting at birth, lay the foundation for later success in school and in life. Congress must lift the caps on non-defense discretionary spending and choose to invest in the underdogs — our babies. There is simply too much at stake to continue these artificial ceilings on children’s futures.